Best of Houzz again this year! 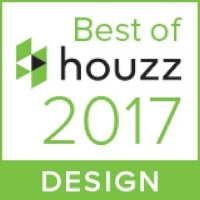 We have been winning Best of Houzz each year since 2013. Have you heard of Houzz? Houzz.com is an interesting website. It is used by members for making "Idea books" from photographs collected on their site. The general public (Members) collect their ideas of beauty in digital form, which become virtual scrapbooks. These are presented to a creative professional (Pro), who in turn helps the member turn their ideas into reality. Interior Designers and Architects probably get the most business from it, followed by specialty Contractors, custom Builders and yours truly. While I may not benefit directly, my customers have the branding images that get noticed, and that brings them business. It helps when one of the Houzz editors picks up a photograph and gives it a wide distribution in a story. As a result, some of my photographs are in tens of thousands of Houzz Idea books. When one of my customers mentions me as the photographer of one of our projects, it is posted to my Houzz site, which is good for both of us. I invite you to visit my Houzz site, see the projects posted there and perhaps dream up your own Idea book.